The Yemeni army and popular forces hit Saudi Arabia’s Jizan border region with tens of missiles on Saturday. The Yemeni forces fired at least 80 missiles against the Saudi army’s positions in Jizan region. There are still no reports on the extent of the Saudi casualties in the border areas. The attack came after Saudi warplanes pounded the areas of Bani Sayah and Sahar in Sa’ada province and claimed the lives of more than 70 civilians. Earlier today, the Yemeni army fired a Scud missile into Saudi Arabia, forcing the monarchy’s officials to cancel all Jizan and Abha flights. According to media reports, the missile was fired early Saturday morning at the Saudi regime’s largest air force base located in the city of Khamees al-Mushait in the kingdom’s Southwest. Saudi Arabia claimed that it had intercepted the Scud by two Patriot missiles. This is while the airport terminals of Jizan and Abha were evacuated and flights cancelled following the attack. 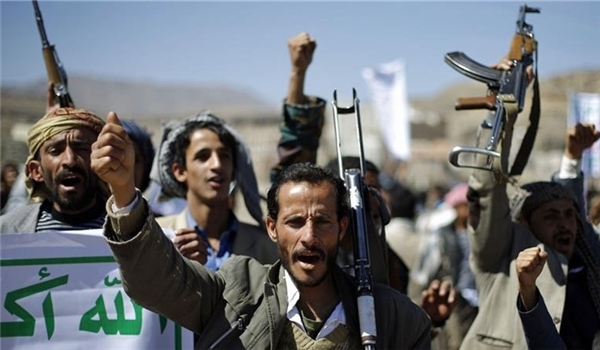 Also on Saturday, the Yemeni sources confirmed that the missiles fired by the popular forces against the Saudi targets inflicted substantial losses on an arms depot and four military patrol vehicles, killing several Saudi forces. The missile attacks which were carried out in Towailaq district in the Saudi border region of Jizan was revealed by a military source to Yemen’s SABA news agency during an interview. “A large number of Saudi military aggression forces were killed in the attacks,” the source, who asked to remain unnamed, said. The Saudi defense minister has yet to confirm and show reaction to the attack. Officials in Riyadh announced on Friday that the Yemeni forces had killed four Saudi soldiers in the Southwestern cities of Jizan and Najran near the border with Yemen. Riyadh published a statement on Friday, saying that four Saudi border guards were killed after Yemeni troops launched retaliatory attacks on the cities of Jizan and Najran. Saudi Arabia has been bombing Yemen in the last 73 days to bring its ally, fugitive president Mansour Hadi, back to power. The airstrikes have so far claimed the lives of more than 4,318 civilians, mostly women and children.